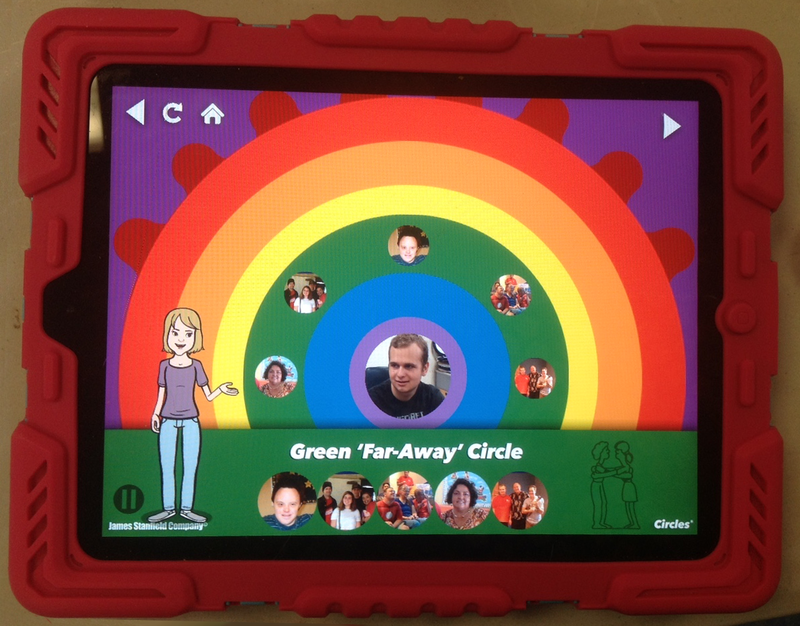 Circles Social Skills Utility™ reinforces personal space! 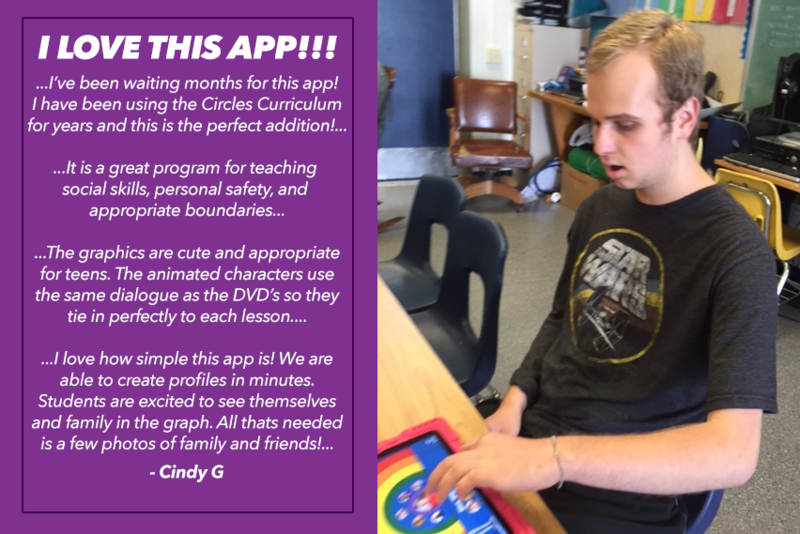 After downloading the app, Cindy gave us some great feedback about how the app works for her teenage students. Some of her best results came from taking photos of her students as well as uploading different pictures to her iPad. Cindy’s students with special needs were so excited to see themselves in the Circles, and she reported that it allowed her students to be more engaged in the activity. Cindy then told us about another special student of hers—Daniel. Cindy shared photos of some of Daniel’s Circles! 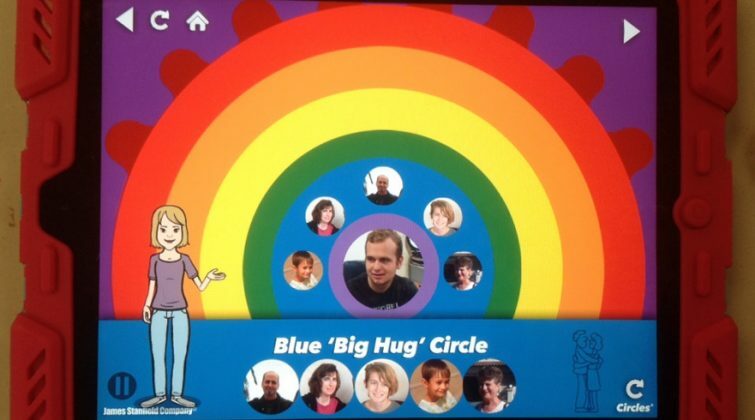 He has been doing a great job practicing personal space and social boundaries through the Circles Social Skills Utility™. Daniel had great success in recognizing and naming all of his family members after adding photos of them to his Circles. “Seeing the pictures of his family are very reinforcing for him!” she added. He was also able to add some of his female classmates to the Orange Wave Circle. Cindy added that the app helped reinforce that we wave to—and not touch—the people in our Orange Wave Circle, even if we see them a lot. As you can see, a simple group photo is a great way to put entire groups of students in a circle! Daniel’s classmates were able to talk with him about the Orange Wave Circle and why they would like to share only a wave with him. In this sense, the Circles Social Skills Utility™ strengthened the whole class’s knowledge of these relationship boundaries, and even sparked a discussion about why some students may prefer a wave to a handshake. The Circles Social Skills Utility™ made these often difficult subjects of personal space into something tangible and easy for the students to understand. It also helped students feel more comfortable expressing their boundaries to each other. If you have any questions about the Circles Social Skills Utility™ or the Circles Curriculum, contact us through our contact form on circlesapp.com!